Before we begin, it is important to note that gold is naturally a yellow metal, and that any other forms of gold, including white and rose, are combinations of gold with other metals – we call these combinations alloys. 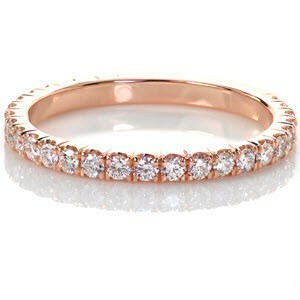 We’ll talk more about that in the next section, but in the meantime you should know that rose gold is an excellent way to add personality to your jewelry as well as give it a signature, unique appearance – in fact, rose gold is beginning to gain popularity and momentum among jewelers and customers alike, especially here at Knox Jewelers. Without further ado, let’s learn all about rose gold. 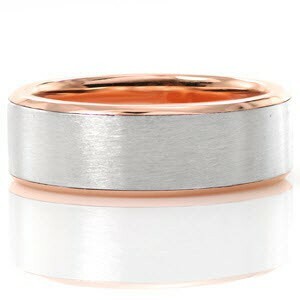 As we said before, rose gold is a combination of gold and another metal. 14K rose gold is usually formed with gold (about three fourths), copper (about one fifth), and a marginal amount of silver. This blend of metals allows for 14K rose gold to be strong enough for jewelry as well as have its distinctive rosy hue from which it derives its name. Rose gold has been steadily gaining in popularity, and for good reason – no other alloy quite matches the splendor and beauty of this red-tinted gold. 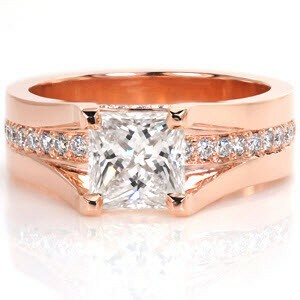 More and more individuals are choosing to utilize rose gold in their custom engagement rings and wedding bands. 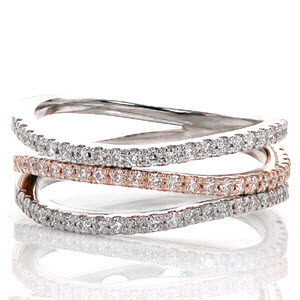 Our designers have successfully used rose gold in a variety of one-of-a-kind pieces, and we are quite thrilled by the rise in popularity of this gold alloy for many creative reasons. 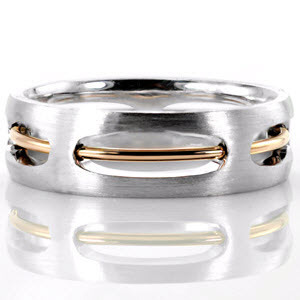 Even men’s wedding bands are starting to feature rose gold! One of the areas in which rose gold is extraordinarily useful is in the practice of Mokume Gane. At Knox Jewelers, we are experts in these techniques, and having the option of using rose gold in conjunction with yellow and white gold can allow us to design some truly stunning Mokume Gane rings. In the next section, we’ll take a look at these designs as well as other ones we have crafted by hand for our customers in the past. 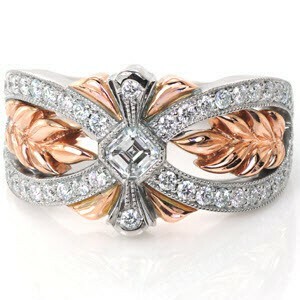 This design makes exclusive use of 14K rose gold to give the ring a bright hue and warm texture. Combined with our detailed hand engravings and milgrain textures, North Shore Rose’s rose gold base truly looks fantastic all on its own without other metals or stones. 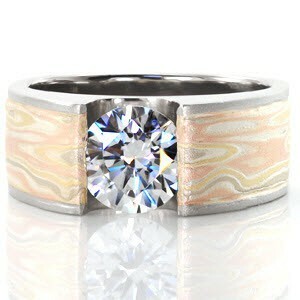 Flora is one of our stunning examples of Mokume Gane craftsmanship. 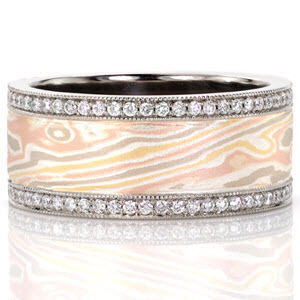 This piece uses three metals: 14k yellow gold, white gold, and rose gold, all mixed and blended together to give the natural appearance for which Mokume Gane is so well regarded. 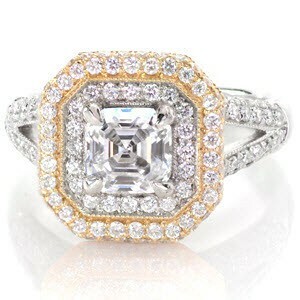 We’ve also added two rows of lovely, sparkling diamonds to give this ring a beautiful aesthetic. Finally, Design 2903 shows how regal and vibrant 14k rose gold can look in conjunction with a center stone – in this case, a 1.25ct princess cut center diamond. 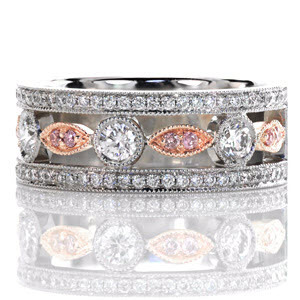 Rose gold is a truly versatile alloy that is both durable, striking, and warm, and we think that these designs truly make the case for its use in practically any context, including with diamonds, other stones, hand engravings, and more. Designs featuring multiple metals are another way to add more detail to a design. 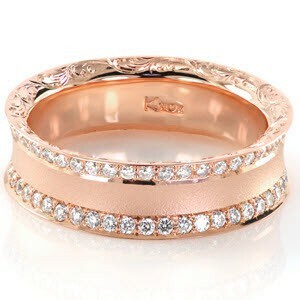 As you can see, the warm hue of the rose gold stands out beautifully against the cool luster of the white gold. We are more than happy to hand sketch or create a computer mock-up of your preferred design with rose gold. If this might be something in which you are interested, please let us know. We will create a detailed sketch of your piece and allow you to make modifications as you see fit – helping you to design a custom engagement ring or wedding band is what we are here to do. We do not simply design stunning and unique engagement rings and wedding bands – we also go the extra mile in ensuring our customers understand exactly what goes into the process as well as give them complete freedom in the outcome of a particular design. If you have any questions about rose gold, please do not hesitate to contact us. 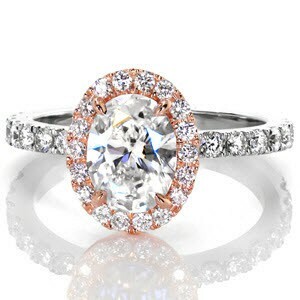 We look forward to working together with you to design a beautiful rose gold engagement ring or wedding band! Just what is yellow gold, exactly? Is it special or unique in some way? The answer is a resounding YES. 24k yellow gold is pure gold. It is the baseline for all forms of gold; in other words, yellow gold is what comes out of the mine. Colored golds like white gold are typically alloyed with silver, nickel, and other similar classes of metals to give it that whiteness. 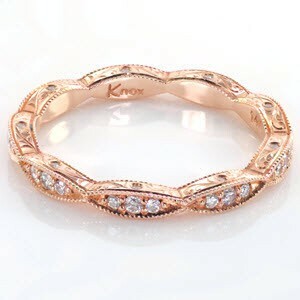 Rose gold’s alloy is made up of mostly yellow gold and copper which results in the beautiful, warm peachy hue. 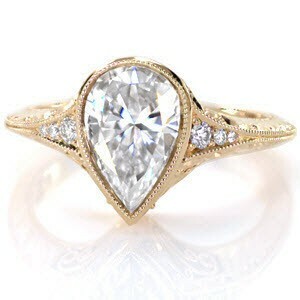 More and more of our valued customers are beginning to opt for yellow gold engagement rings, weddings bands, and more. 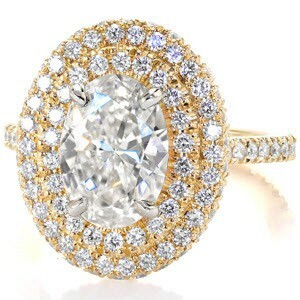 At Knox Jewelers, we love to work with yellow gold, and we are ecstatic that it is making a come back on the market. Even yellow gold is alloyed with other metals, commonly copper and silver, to create a more durable metal for use in jewelry. Pure gold is very soft and malleable and while some pieces may be made from 24k gold, rings especially should not be made from pure gold because the daily wear and tear will be too much for it. Our favorite is 14k yellow gold because it meets the right balance between durability, cost effectiveness, and aesthetic quality. 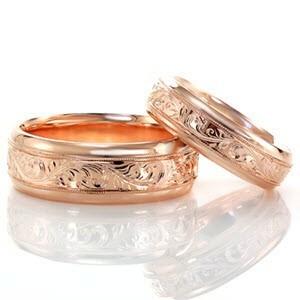 18k makes for beautiful rings as well, as you can see in the two rings below. The higher content of gold in the alloy provides a more vibrant yellow color than the 14k gold, but it is not as durable as the 14k gold. It is also more expensive. What sets us apart at Knox Jewelers is our commitment to ensuring you have the perfect blend of pure gold and metal alloy that balances the issues associated with both. Certain kinds of alloy blends can have issues down the road, including weaknesses in the internal structure of the piece, and a lack of ductility which can also cause many issues. That is why we are dedicated to providing you with alloys which ensure maximum durability, strength, and beauty for your jewelry. Now that you have a good understanding of the characteristics of yellow gold, let’s take a look at some of the yellow gold engagement rings and wedding bands we have created for customers at Knox Jewelers in the past. Each of these rings has its own unique style, and we hand-tailor each of our exquisite pieces exclusively for our clients. Without further ado, let’s take a look at some of the stunning examples of engagement rings and wedding bands we have crafted for our customers. Design 2627 is inspired by the natural, fractal patterns of nature, thus evoking a sense of leaves, petals, and other organic entities. 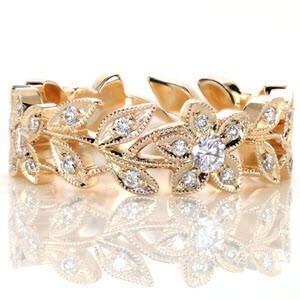 It is made of the 14k yellow gold that we described previously, and it has a side weight of .44 ct. The leaves and stem system of the ring circumnavigate the entirety of the band, and they are also accented with beautiful micro pavé diamonds and outlined with a lovely milgrain texture. To complete the natural appearance of this exquisite piece, we then add larger round diamonds to represent the iconic circular shape of the flower center. Our Frejay design is an absolutely stunning piece. 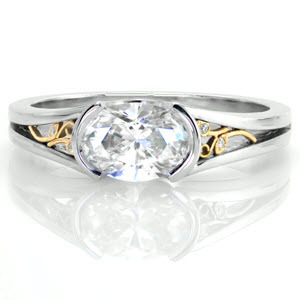 Its baseline material is 14k yellow gold, like our other yellow gold engagement rings and wedding bands. The centerpiece of this exquisite design is the large rare-colored sapphire. Yellow gold is perfect for bringing out the warm tones of this rare sapphire. We then added an uniquely designed halo to the center to orbit the sapphire. It is bead-set with vibrant diamonds to complement the warm tones of the yellow gold and the sapphire. Finally, the hand engraved designs and hand formed filigree curls of the piece truly make it one of our most beautiful rings. Our Design 3004 is the pinnacle of luxury and beauty. 14k yellow gold forms the baseline material for this piece, and two concentric rings of micro pavé diamonds orbit a center stone. As you can see, the diamonds and yellow gold go perfectly together, as the yellow gold band provides a great level of contrast for the stones. Regardless of the angle at which you view Design 3004, it is bound to look stunning in every way. As you have seen, yellow gold can be used in a variety of designs to accentuate the warm color tones of the other elements. It is perfect for both complementing and contrasting with other elements in a piece. We hope you enjoyed learning about yellow gold; please contact us if you have any questions about using it for your own rings. We always recommend our 950 Platinum-Ruthenium alloy. It’s the best metal for engagement rings and wedding bands. The most important characteristic in Platinum jewelry is Platinum’s resistance to metal loss caused by normal wear & tear. When metal is rubbed against another object, a little bit of that metal is rubbing off onto the other surface. If the metal is Platinum, the amount lost is exponentially smaller than the amount that would rub off from a gold item. 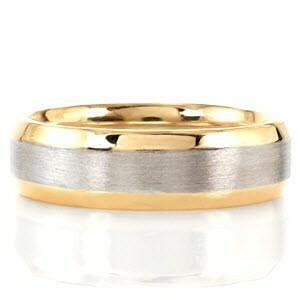 This translates into Platinum rings lasting two or three times as long as a similar gold ring. Our 950 Platinum-Ruthenium blend is the best Platinum alloy for jewelry. It has the best combination of tensile strength and hardness amongst all Platinum blends. Tensile strength refers to the durability of the metal and hardness refers to the scratch resistance. More common Platinum alloys like 950 Platinum-Iridium are softer and tend to scratch and bend almost twice as easy. Manufacturers typically use this blend because of it’s ease to cast and work with. Often times, you’ll see or hear of Platinum engagement rings that scratch very easily and/or have become bent. These are most likely made of 950 Platinum-Iridium. Our Platinum won’t do that. We purposely use a stronger alloy so you can enjoy your rings for a lifetime. Our white gold is a blend of gold and nickel alloy. Nickel gives white gold its whitish color and helps increases the metals hardness. While nickel helps in whitening white gold, it doesn’t completely make it white. Our alloy does require Rhodium plating every six months. We also work in 18k White Gold. This alloy has more precious gold and is a little heavier than 14k White Gold. 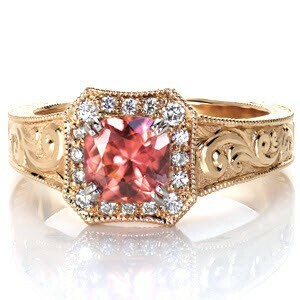 The natural color is very comparable to 14k and does require Rhodium plating. All of our white metal jewelry items will look virtually identical coming out of our shop. After several months of wear, a white gold ring may need to be re-plated where as a platinum ring is always white. After a decade or two, a white gold ring may require re-tipping of prongs and channels. Platinum wears away at a much lesser rate than white gold and it is not uncommon for Platinum to last a lifetime. We work in both 14k and 18k Yellow Gold. These alloys are softer than there white counterparts. Rings made in yellow gold are more prone to wear and tear than white metals. Due primarily to the density of Platinum, it is much more difficult to achieve a perfectly polished finished surface. Therefore, it takes much more labor to produce a Platinum ring over an identical White Gold piece. Platinum is at least twice as expensive and can at times be 3-4 times as expensive as a White Gold ring. The exact amount is based on many variables. Because Platinum is renowned for it’s durability, we highly recommend having the crown or prongs of your ring made in Platinum. This will help protect your diamonds and gemstones longer than Gold. When customers ask what our metal of choice is for their engagement ring, they will always be told Platinum. 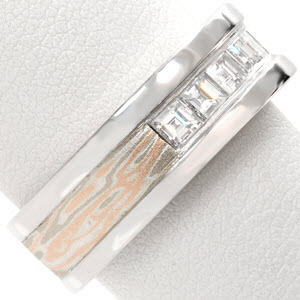 Platinum has many desirable attributes that will make your ring look spectacular and last a life time. For reference sake, we use 950 Platinum Ruthenium, which has the best combination of tensile strength (durability) and scratch resistance compared to other Platinum alloys. Platinum is hands down the best metal to use in jewelry. It’s a very heavy, dense metal, providing a strong hold on stones and solid structural integrity. Platinum does not wear down like other precious metals. When scratched, the metal is actually displaced and pushed elsewhere on the ring, not rubbed or worn off. This characteristic puts Platinum in a class of it’s own, making it suitable for everyday wear over a lifetime and maintaining the greatest security for your gemstones. Platinum is and will always be white. It will never yellow like white gold, which requires Rhodium plating. It will never tarnish like silver either. Platinum’s natural white color is ideal for settings, from colorless diamonds to vibrant gemstones. Platinum is also hypoallergenic unlike common white gold alloys which contain nickel. Imagine your finance not being able to wear her ring because she’s allergic to it. Platinum does not react with Chlorine, unlike white gold, which will corrode and discolor. Chlorine is found in pools, hot tubs, and common house cleaning chemicals. When making a decision on the right ring, make sure you understand what it’s made of. We want your setting to last a lifetime, protecting the valuable gemstones it holds. No metal does this better then Platinum. With a platinum engagement ring, you don’t have to worry about allergic reactions, chemical breakdowns, or yellowing color. Make Platinum your metal of choice for life. What is The Best White Gold? What is White Gold Alloyed With? Are All White Golds the Same? First, an explanation of white gold and gold alloying. 14K gold is alloyed with other metals to achieve certain colors and/or workability attributes (malleability, ductility, etc.). The different colors are self explanatory E.g. ; whiter alloys such as silver or nickel mask the natural yellow of pure gold. Workability characteristics will vary considerably depending on the mix of the alloy metals. Pure gold is very malleable and easily worked into various shapes, forms, wires, etc. However, pure gold (24K) is generally considered too soft for rings. Almost all yellow gold blends are much more workable and ductile than their white gold counterparts. Most white golds are alloyed with nickel, a very white and very hard metal. The ideal workability attributes necessary for a hand wrought item will often require a different mix of alloy metals than the normal mix of alloys for a cast item. Some of the popular alloy metals for white gold are copper, silver, zinc, nickel and in some of the newer blends, Palladium. The white Gold blends that are alloyed with palladium are growing in popularity as they provide very workable castings and at the same time avoid many of the negatives issues associated with Nickel alloy mixes. It should be noted that these Palladium white Gold blends are typically not as bright white as some of the high nickel content blends. 14K white gold is 58% pure gold. The other 42% of metals used to make the 14K white gold and help mask the yellow of the predominant metal (58% pure gold) will vary considerably as the various gold manufacturers and casters look to develop gold blends with the best mix of whiteness and wear attributes. The same holds true for 18k White Gold, which is 75% pure gold. Refiners, manufacturers, and jewelers experiment to find the optimal mix of alloys for their applications.Historically, some of the whiter blends of white gold have been some of the poorer performing alloys with regard to durability and longevity of jewelry items. The problems stem from the difficulty of mixing the different alloys to combine and make a homogeneous blend of metals that will be workable, malleable and otherwise suitable for jewelry making. (1)Porosity in the metal. Actual voids or unfilled areas in the casting that lead to weakness or even failure of the cast item. (2)Brittleness or lack of ductility. Nickel has been a very popular alloy metal to use for white gold because of the very white color and the hardness it gives the white gold alloy. However, many white gold alloys that contain nickel may not be optimal for smaller elements of jewelry designs such as crowns (the prong elements that are used to hold diamonds) as these smaller elements may be prone to weakening and eventual breakdown due to the corrosive behavior of nickel in these white gold alloys, especially in conjunction with any exposure to environments that have chlorine such as pools, spas, etc. It should be mentioned that nickel is also associated with allergic reactions which is not a good thing to have happen with an engagement ring or wedding band. There have been many recent advances in new white gold alloys from? the major precious metal refiners that service the jewelry manufacturing industry, all trying to find that magic mix that will remedy the above mentioned problems in many white gold mixes and provide a workable and white mix. Stuller Settings, a major manufacturer and supplier to jewelry stores : http://www.stuller.com/apps/images/kbpdfs/x1.pdf has a new blend of white gold called X-1 that is very white. Other refiners and manufacturers are also coming out with versions. 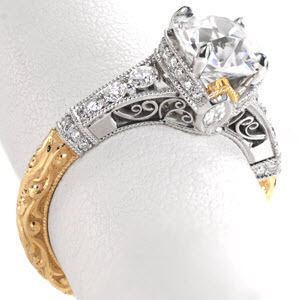 Bottom line, if you are considering a white gold jewelry item, be sure your jeweler is aware of the many recent advancements and products available. If your jeweler is aware of these choices they should also be able to recommend the optimal blend for the application as there may be design specific issues that could affect the choice. Author adminPosted on August 2, 2007 February 7, 2014 Categories Ring Metal InfoTags Copper, Corrosion, Nickel, Palladium, plating, Silver, White Gold, ZincLeave a comment on All About White Gold.